Hepato-Synergy™ integrates four complementary formulas that are each designed to help support hepatic detoxication. * Metacrin-DX™ (K10), BileMin™ (K11), Methyl-SP™ (K14), and Glutathione Recycler™ (K57) are put together into one easy-to-use package for the client. Each serving is packaged individually with the combination of these four formulas. 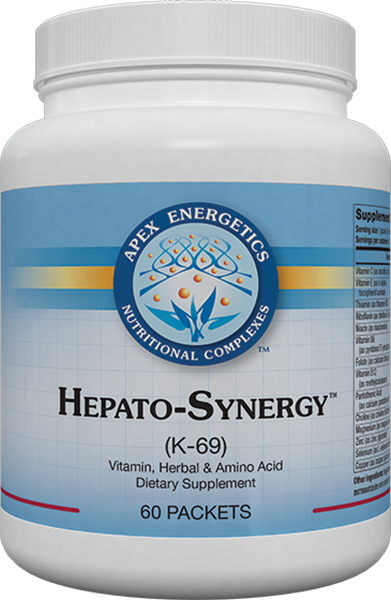 Hepato-Synergy™ includes high-potency vitamin C, vitamin B6, vitamin B12, thiamin, riboflavin, niacin, folate, pantothenic acid, and molybdenum. It is also an excellent source of vitamin E, magnesium, zinc, and selenium. Suggested use: Take 1 packet once a day, or as directed by your healthcare professional. Other ingredients: Vegetarian capsule (hypromellose), cellulose, dicalcium phosphate, silica. Contains Soy (phospholipids).